I don’t know how I didn’t find this earlier, and how it’s been overlooked for so long…. But this incredible program, LINE, will run statically linked Linux ELF binaries on Windows. Yes, you read that right, this user mode program will load an ELF exe, and run it under a software debugger with no need for device drivers, and intercept all the sycalls (ie int 0x80’s) through the cygwin1.dll, giving you a POSX/Command line linux experience. It does come bundled with various hello programs, and a few things on testing forks… But the real magic for me was being able to grab a static version of dungeon, and running it on both Windows 7 x64, and emulated NT 4.0. I’ve put my copy of dungeon, along with a copy of cygwin1.dll that works with the LINE package here for anyone interested. I’m just amazed at the size, and simplicity of the whole thing…..
Clearly this project should have had more of a future to it! What is better then Doom? Oh my god… DOOM IN DOOM! You can read more about fully interactive surfaces here, and of course, download their demo. Author neozeedPosted on December 30, 2010 October 8, 2016 Categories doom, games1 Comment on What is better then Doom? And because I had a request for it, here is a 7zip containing a makefile, and source suitable for building quake under MS-DOS. I sourced it from the Doom makefile, and cross built it under OS X… It builds in under 5 seconds using all 4 cpu’s on my OS X box with my OS X to MSDOS DJGPP cross compiler…. 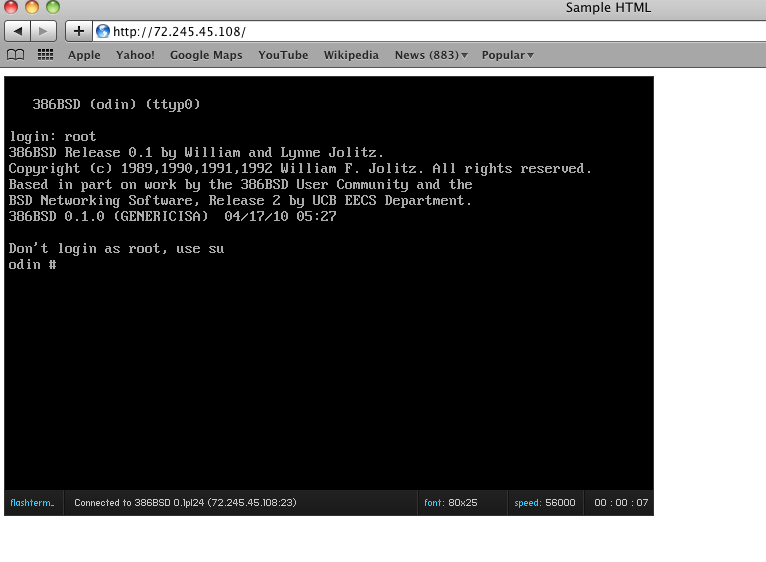 I had forgotten that the gpl’d source included MS-DOS support.. I had taken the video part from Chi Hoang’s DOS port of DOOM and gotten it to run until I remembered.. Oh well a few hours wasted. And speaking of Quake, it’s on sale too! But just for today, on steam….. So building on DOOM, I thought I’d try to build a djgpp cross compiler from my main OS X box, as compiling under DOSBox is… just too slow. Luckily Delorie has a page on building a cross compiler. First I had to run configure like this, as OS X didn’t exist back then, let alone x64 cpu’s.. So I just edited libiberty/strerror.c, and commented out the following line. I simply commented out the lines. Next up was gcc. I couldn’t get 2.8.1 to build, instead I built gcc-2.95.3. And it threw the same error as binutils… with the same fix (commenting out the line in libiberty/strerror.c). And again I just commented it out. Under OSX the makeinfo parts crashed, so I simply removed them from the makefile. With a little more tweaking the cross compiler was ready! REMEMBER TO FOLLOW DJ’s steps too! 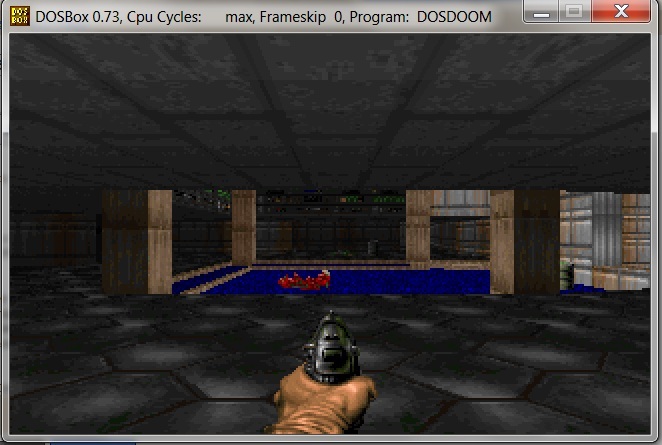 The cool thing is that now I can run make with the -j4 flags allowing gcc to run on each of the cpu cores letting me build doom in under 3 seconds! For any curious OS X 64bit users out there you can download my binary toolchain here. I would imagine that if you stuck with versions of binutils & gcc that build on your platform you too should be able to build a MS-DOS DJGPP cross compiler. 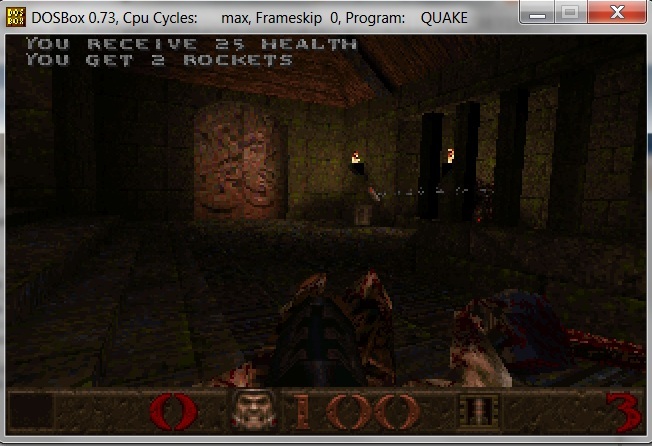 And there is nothing like native 64bit tools for building for DOSBox… Oh and DOOM runs just fine, although I guess screen shots of the cross compiled exe is… redundant. Today while checking out eets on steam ( yeah I know… ) I came across this sale… It’s Doom, Doom II, and Doom III all together, with all the expansion sets for $8.74 USD! Well needless to say I couldn’t resist the offer, so I bought it. While playing around with Doom, I was wondering what was the first port of the Linux X11 doom back to MS-DOS. A bit of googling brought me to the doom wiki, and from there it seems that “DOSDoom” version is the first source port returning DOOM back to MS-DOS. As mentioned in Chi Hoang’s notes, it took him 4-5 hours to do the initial port. So I figured it’d be worth re-creating the 0.1 version of his work, under DOSBOX with DJGPP. I did find out the hard way that there is a single assembly clause that breaks under newer versions of DJGPP, and there is a small issue with the HOME environment variable that if it’s not set it’ll crash DOOM. So I ‘fixed’ that to use the current directory. To install this legacy version of DJGPP, I found the needed files..
Which… has no networking support, no audio, but it does work! This port is overall minimally invasive to the code, and I’d suspect it’d make it a very easy starting point for yet even more ports of doom… I think there is over 40 out there. That’s the one great thing about making the source available, is that the product lives on and on! 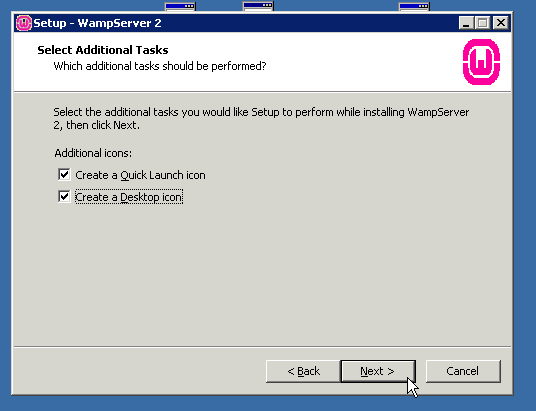 As I was writing my WAMP installation guides, it turns out that a new version, 2.1c was just released! I’ve updated the links, but it’s great to see WAMP is very much alive! 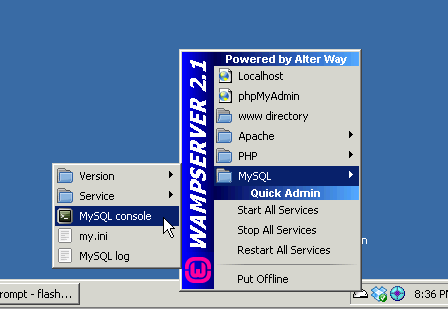 All of the WAMP releases for 2.1 can be found on sourceforge. 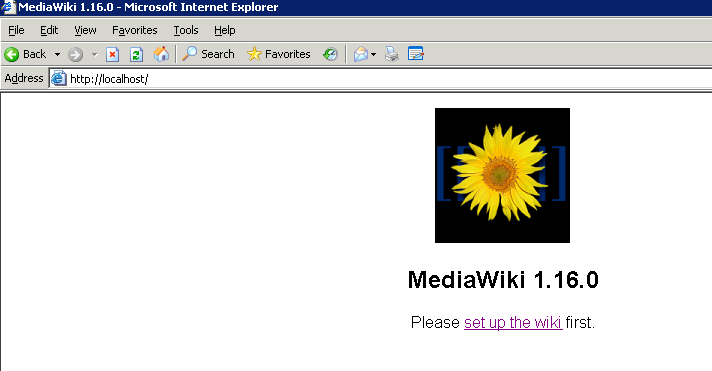 Building on our WAMP installation, we are now going to install mediawiki. The first thing I’d recommend to do is to move the contents of c:\wamp\www into another directory… I just shoved the terminal thing into c:\wamp\terminal . Now mediawiki is the software that powers wikipedia. It’s a great collaboration platform, it has built in revision control, and best of all it’s free. It’s also VERY simple to setup, well compared to other web content platforms. The current version is 1.16, which can be downloaded here. As things change, you may be best served by just visiting the main download site. Since most ‘AMP’ servers are Linux based, we’ll have to get gzip & tar to extract mediawiki. It’s very easy though. 12/28/2010 08:15 PM DIR . 12/28/2010 08:15 PM DIR ..
Now before we go on, we are going to set a password for the MySQL process. In the off chance someone is following this on a server to deploy on the internet, it’d be crazy to leave it with no password. So left click on the WAMP system tray icon, go to MySQL, and bring up the MySQL Console. Just hit enter for the password as there isn’t one. Next follow this SQL statement to set the password for the root user to password. Or select your own better password. Now restart the mysql service, by clicking on the system tray icon, then mysql, service then ‘restart service’. If you don’t do this the password change will not take effect! First is the wikiname. I’m just going to call mine ‘test wiki’. Put in your own contact email, so that mediawiki will email YOU if anything is going on… I left the language in English, and left the license alone. The next important thing to do is to select a Admin username, and password. This is all up to you. Just remember that the Username is CaSe SeNsItIvE!!! The next section is for the email notifications, I just left those as default. The final thing to configure is the database. Since we are going to keep this simple, just set the DB username to root, and put in the password you configured earlier in the MySQL Console. Next check the ‘superuser account’ box, and specify root and the password again. 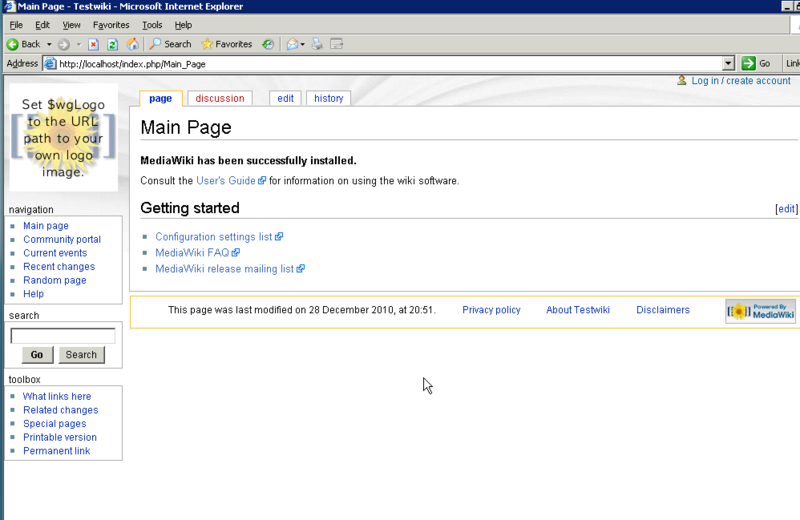 You can now click the Install MediaWiki button! Installation successful! Move the config/LocalSettings.php file to the parent directory, then follow this link to your wiki. And that should take care of it! Now with WAMP installed Let’s go on to flashterm. Download the latest version of flashterm, which will include the flashsocket.php file. Finally, we need to edit the flashsocket.php file. which would allow all of these ports to be accessible to Flashterm… This is the big advantage of the php server version, as it can have multiple ports. For now though, I’m just going to use the default which will allow connections on the standard telnet port of 23. Now we just need to edit the settings.xml to point to the correct location. Then we load it up in a browser, hit the connect button, and there we go!! You can always play around with the info_graphic, by overlaying a picture, but I’ll leave that up to you. Due to a request, I figured I’d document out the joys of installing WAMP, flashterm & the flash policy server, mediawiki in a multipart article. So to start, we’ll build the foundation which is the WAMP package which the other two will rely on. 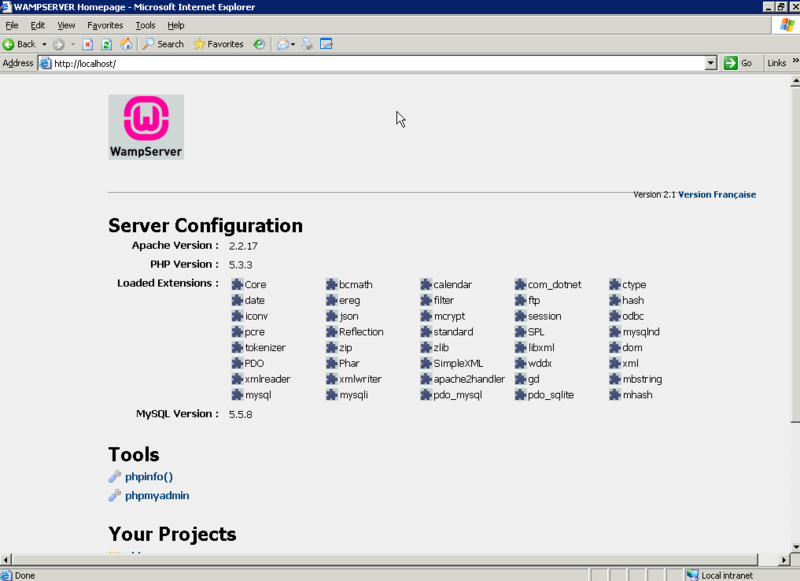 So what is WAMP, well it’s Windows Apache Mysql & PHP. If you’ve ever heard of LAMP, this is the Windows version. And I’m happy to say that PHP applications seem to be pretty portable, allowing you to freely move data & applications to & from Linux/BSD/Solaris/Windows. Or that’s been my experience. 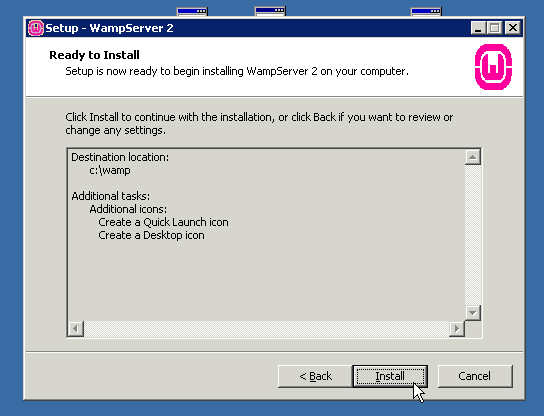 The first thing you’ll need to do is install the WAMP package. 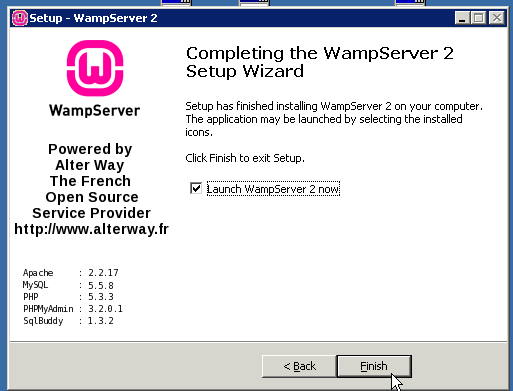 Luckily for us, the WampServer project has packaged the whole thing up into a nice windows installer. And the new version (2.1c) even includes x64 bulids! So for the 32bit crowd you can download WAMP here. 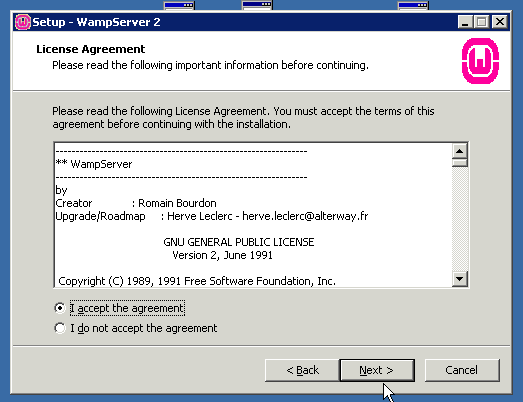 And for the x64 64bit crowd, download WAMP here. I’m currently using an aging HP machine as my server so I’m using Windows Server 2003 along with the 32bit version. 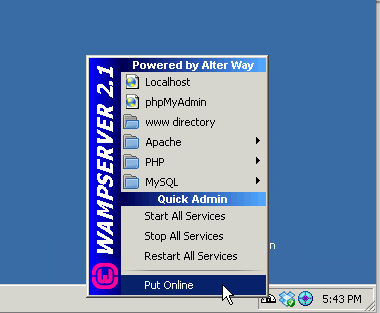 WAMP works best when it’s just installed with the defaults. The first thing I do is I install the SMTP service that comes with Windows. I leave IIS off as it’s kind of silly to have two web servers, unless you are doing it for some planned reason (say Virtual Server which needs IIS and uses port 1024). If you do have IIS make sure the ‘default’ website is turned off. All that has to be done with the SMTP server is configure it to allow 127.0.0.1 to relay emails.. As it’s nice to get notifications that could be built in with whatever PHP application you go with. Now run the installer, and I’ll try to walk through the steps. Let it install in the default directory, it makes things easier. I like both set, you may not, but it’s easier to launch. Now WAMP will copy files and install. Then WAMP will want to know the default browser, honestly IE is just fine. With the install completed let it launch WAMP.  Once the WAMP server is installed it’ll be stopped and offline. 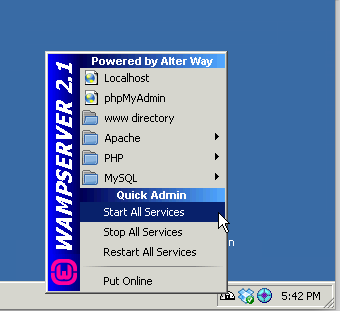 Left click on the WAMP tray tool, and have it start all the services. If everything has gone right your WAMP tray tool will look like this! Congratulations! 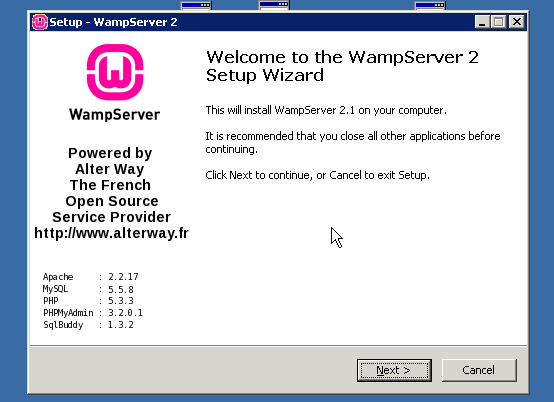 You’ve successfully installed the WAMP server!